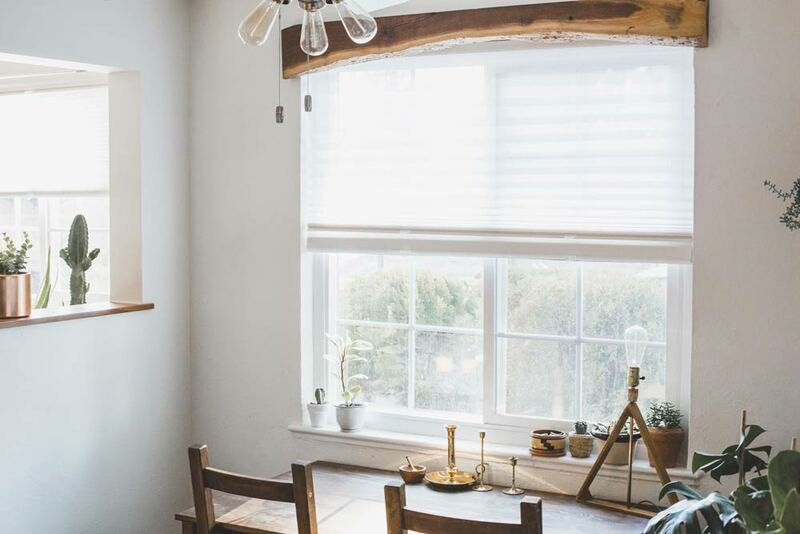 Dreamy light-diffusing cellular shades are the perfect match for bohemian decor lover and photographer Abigail Green + her Denver home. Outdoors, camping and travel lovers flock to Abigail’s blog for her gorgeous photos and poignant sentiments. Not to mention her eclectic southwestern style, stories, recipes and home decor inspiration. See more of her window makeover project here: Home Project // collaboration with blinds.com. Abigail wanted a clean, crisp look for her windows and Premium Light Filtering Cellular Shades were the perfect fit. She wanted the option for privacy and lots of natural light, so she chose the Trilight option. This is a 2-in-1 shade with a sheer pleated fabric on top and a cellular shade on the bottom. The shade can be shifted for either fabric to fully cover the window, or somewhere in between. This option allows a clear but private view that is great for the daytime. It also protects furnishings from the harsh sun because of its built in UV protection. Honeycomb shades are great for insulation and privacy while filtering light into a room. Abigail chose the cordless option which is great for child safety. Other options include standard corded, top-down / bottom-up in corded and cordless, continuous loop or motorized. My favorite part is that both fabrics can be pulled down either halfway or all the way! They fit our home aesthetic wonderfully. Simple. Clean. Light. All parts in hand & ready to go. 3 brackets per blinds & a handful of screws—sure seemed simple enough!-@abigailmarygreen #AMGxBLINDS Enter the Giveaway! We’re also giving away 2 $100 Blinds.com Gift Cards to lucky followers. To enter, follow @BlindsDotCom and @abigailmarygreen + comment on one of the #AMGxBLINDS photos this weekend. We’ll randomly choose 2 winners on @BlindsDotCom Monday 9/14 at 12m CST. Our favorite part is that the measurements didn’t have to be exact because the blinds are so seamless & sleek that they cover the brackets once they’re secured in! -@abigailmarygreen #AMGxBLINDS Enter the Giveaway! We’re also giving away 2 $100 Blinds.com Gift Cards to lucky followers. To enter, follow @BlindsDotCom and @abigailmarygreen + comment on one of the #AMGxBLINDS photos this weekend. We’ll randomly choose 2 winners on @BlindsDotCom Monday 9/14 at 12m CST. We love the privacy the honeycomb shades offer us, especially for this front window that faces our street. I love to keep the blinds up for the daytime & then pull them halfway down for privacy as well as filtering intense sunset light during dinner. -@abigailmarygreen #AMGxBLINDS Enter the Giveaway! We’re also giving away 2 $100 Blinds.com Gift Cards to lucky followers. To enter, follow @BlindsDotCom and @abigailmarygreen + comment on one of the #AMGxBLINDS photos this weekend. We’ll randomly choose 2 winners on @BlindsDotCom Monday 9/14 at 12m CST. & that’s a wrap! Thank you so much for having us around, Blinds.com. You have made fans out of us, our windows, & our many plants! -@abigailmarygreen #AMGxBLINDS Enter the Giveaway! We’re also giving away 2 $100 Blinds.com Gift Cards to lucky followers. To enter, follow @BlindsDotCom and @abigailmarygreen + comment on one of the #AMGxBLINDS photos this weekend. We’ll randomly choose 2 winners on @BlindsDotCom Monday 9/14 at 12m CST. Abigail chose Premium Light Filtering Cellular Shades in white/W201 for the trilight fabric & white/DLF-812 for the double cell honeycomb fabric. Ready to get started with your project? Check out our guide – how to measure for cellular shades.